Recovering from PTSD is a process that can involve many avenues such as therapy, support groups or channeling emotions into specific activities. Having a service dog can help with the recovery process of PTSD. This article elaborates on the options that those with PTSD have on their road to recovery. Recovering from PTSD is difficult. Although the basic symptoms of PTSD are consistent across the board, each individual responds and copes with them in different ways. There are several evidence-supported treatments for PTSD. Each of these treatments takes time but their solutions have been shown to be effective at helping people with PTSD recover as much as possible. There are generally two types of research-proven treatments: medication and therapy, discussed below. Antidepressants: these medications treat the symptoms of PTSD that are caused by chemical imbalances in the brain. They come in the form of SSRIs (selective serotonin reuptake inhibitors), SNRIs (selective norepinephrine reuptake inhibitors), and tricyclic antidepressants. Antianxiety (anxiolytic) drugs: these drugs work well in treating the anxiety symptoms of PTSD. These drugs act on chemicals in the brain to provide rapid relief from symptoms of anxiety. They are effective at producing a calming effect but are not recommended as a long-term solution for PTSD because the person can become physically dependent on them. Mood stabilizers: these medications help regulate changes in mood. Adrenergic inhibitors: these come in two groups—alpha-adrenergic agonists and beta-blockers. These medications also treat anxiety symptoms but are not categorized under antianxiety drugs. This method tries to help the person think about trauma differently. It utilizes our modern understanding of how the brain works and processes pain and memories and how the body responds. Understanding this mind-body connection and learning how to control and enhance it can help a person heal in a more natural way. Therapy is usually recommended in conjunction with medication. Psychotherapy helps a person cope with painful memories and manage emotional and physiological reactions to stress using a variety of techniques. One category of psychotherapy that is very effective is cognitive behavioral therapy (CBT). There are several types of CBT: cognitive processing, prolonged exposure, and stress inoculation. These are all therapies that are guided by a licensed therapist and help the person afflicted with PTSD to confront, process, and cope with distressing memories and emotions in healthier and more effective ways. One of the ways people are recovering from PTSD is with the help of a service dog. They often use this method as either an alternative or supplemental approach to coping with PTSD. Although there is a lack of peer-reviewed, published clinical trials proving the therapeutic efficacy of service dogs for people with PTSD, the prevalence of this alternative therapy appears to be on the rise. Because of this growth in popularity, new clinical trials and research are underway. The option of a dog specially trained to help those for whom conventional, evidence-backed treatments of PTSD have fallen short deserves consideration. While the majority of evidence suggesting service dogs can help people with PTSD is anecdotal, there is plenty of evidence corroborating the benefits of service dogs for people with physical disabilities. Since PTSD can be debilitating, it makes sense that these services can extend to those with this disorder. Service dogs are now being trained to complete complex tasks specific to alleviating the symptoms of PTSD. For example, dogs can be trained to confirm the safety of a room by patrolling its perimeter. This provides the veteran with a greater sense of safety before entering the room. A service dog can also wake a veteran from a nightmare, administer pressure therapy, and prevent a potentially startling experience by nudging the veteran if someone is approaching unexpectedly or getting too close. Veterans report that after being paired with a trained service dog, their ability to manage their PTSD symptoms improved and, as a result, so did their quality of life. They are able to re-engage in relationships and life activities previously made problematic by their symptoms. In addition, dependence on medications to cope with PTSD symptoms is reduced. Recovering from PTSD with the help of a trained service dog seems to be working for many veterans. This success may be because service dogs address the biological, psychological, and social aspects of PTSD. When a human has a positive interaction with a dog and the dog responds positively and reciprocates the affection, it produces a calming effect. Stress hormones such as cortisol are kept at bay and heart rate is moderated. Hormones such as oxytocin and dopamine are released, which help alleviate the side effects of chronic hyperarousal, social isolation, pain, and sleep disturbances. Overall, it becomes a positive experience that helps a person who may be feeling dejected and lonely to connect with another living thing. These connections, over time, can help a person heal emotionally. Without physical affection and respite from the “demons” of the past, the symptoms of PTSD can seem unbearable. Humans are, after all, social and emotional beings, not just biological and chemical creatures. A service dog may be a viable option for those seeking social and emotional connection, something that may be difficult for those suffering with PTSD because of their symptoms and circumstances. Better emotional health can help mitigate the negative physiological effects of PTSD. If you are interested in more information regarding trained service dogs and their connection to PTSD, Canine Companions for Veterans can help. They partner with skilled dog trainers that prepare dogs to assist veterans with PTSD and help facilitate the process of matching them to the right person. Subscribe to our monthly newsletter and stay up to date on all things CC4V! When you make a donation or sign up to receive our newsletter we keep your information private and secure. 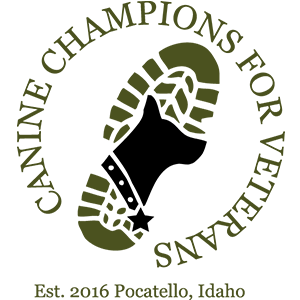 Canine Champions for Veterans, Inc does not distribute your personal information to third party vendors. All information is used to process your payment and to ensure your gift is correctly credited to your account.